Overview: Align your chakras to harmonize your body, mind, and spirit as you spin the reels on our 7 Chakras 5-reel video slot. With 49 paylines, you'll find the perfect chakra balance to feeling good. feeling healthy and feeling wealthy with fantastic big wins. 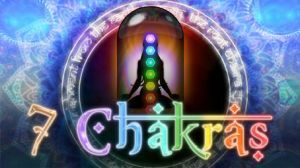 Get ready to unlock your chakras to harness your spiritual energy and feel truly alive with our 7 Chakras slot. The wild symbol is Double High, substituting any symbol except the Scatter symbols and paying double the normal amount for any win that includes the Wild symbol. Reveal 3 or more feature symbols anywhere on the reels and you will launch the Free Spins Ascension feature game. During this feature, you get to choose a Gem from the Lotus for each of the 7 Chakras. Each Gem awards either additional Free Spins or a Free Spin Multiplier increase. Harness your spiritual energy with 7 Chakras! Similar Slots: If you like 7 Chakras, you might like these other slot machines from Saucify: Frontside Spins, Gems n Jewels, Lucky Leprechauns, Perfect Date, Reels of Rock, Tomahawk.